• 25 issues (150 per year) delivered to your shop or club address every two months! • Over 60% discount off cover price, 10% better than wholesale newsstand prices. • For sale or promotional use, your choice! No counting or returning unsold issues. 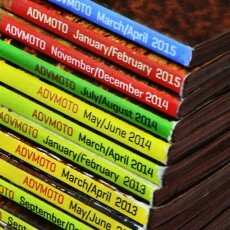 • For dealers, having ADVMoto arrive in your store is a reason to have folks come by and check out the latest products, reviews, news and stories from the US and around the world. • ADVMoto Magazine has a very high retention rate and over 85% of our readers archive every issue. • Most of the program cost is shipping at anywhere between 10 to 25 dollars per box in CONUS. Our goal is to spread the passion for ADV! • Magazines are shipped straight from the printer. Your first shipment will be included in the next print run so may take up to two months to arrive depending on when you join the program. Look for your box to arrive around the middle of every even month. • These are shipped by UPS fresh of the presses and will usually only take 2-4 days to arrive depending on destination address. • Program available only to US dealerships and clubs. Canada and International dealers please contact us for more info.